I wasn’t even thinking of the Perseid meteor showers when I posted my review of Stardust, a movie in which a shooting star is central to the story. Since then I’vs spotted news articles which reminded me that the annual peak time to see shooting stars is upon us! Every August for the last 2000 years, we have been treated to meteor showers as the earth passes by remnants of the Swift-Tuttle comet. This year, because light from the waning crescent moon will be dim, the celestial light show should be especially dramatic. The meteors will be visible from now through August 24, peaking this weekend, on the 11th and 12th. NASA estimates we could see as many as 80-100 shooting stars per hour on those nights. 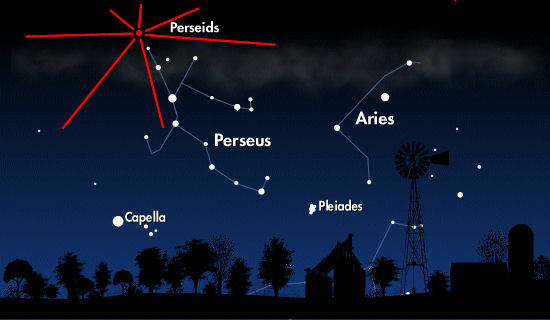 Best viewing will naturally be in places away from city lights, but in past years, I’ve seen the Perseids from the back yard, where there is plenty of ambient light. This is really worth checking out if you get the chance. No matter how many other distractions we face, celestial events like this can stop us in our tracks, open our eyes of wonder, and remind us again of the things that really matter. This entry was posted in Nature, Science and tagged 2013, Nature, Perseid meteor shower, Science. Bookmark the permalink. Light-pollution-free night skies are a real plus to living in the countryside, and spotting Perseid and Geminid meteors are always a highlight of the evening when it’s clear. Living in Wales it’s not always a given, however! Still, thanks for the reminder and fingers crossed for cloudless evenings! I should get a chance to see them relatively light-free on Monday night, but wouldn’t you know that we seem to be in for a cloudy spell, a rarity here in August. Hope it clears up so you can bask in the display! Thanks for the reminder. I will try to get out there tonight.